Your handshake matters more than you might think: ten different ways to shake one’s hand. I’m a firm believer that you can tell a lot about a person’s character by his or her handshake. In a recent job interview workshop, I told my attendees about my obsession with a good handshake and, as a result, a half hour conversation ensued. In the workshop, I talked about the importance of making a great first impression. I said to them, “Someone’s handshake tells me many things about a person. If it is firm, the person is trustworthy, open to engagement, warm spirited, confident, and basically someone who I’d allow my daughter to date.” They all laugh. I get sidetracked and tell them about how my daughter dated a boy who shook my hand for the first time with a limp handshake. I told her soon afterward that her boyfriend better learn how to shake hands if he wants to get anywhere in life. She told me I was being ridiculous. “If it’s limp,” an attendee spoke out, “the person is suspicious, anti-social; someone I wouldn’t want my granddaughter to date.” Laughter erupted. He stole my thunder. 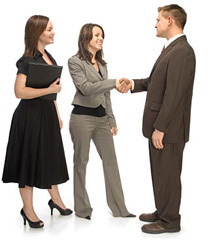 An article on a popular job board states that a proper handshake makes employers overlook some deficiencies in job seekers: “Prospective employers said they’re more likely to overlook visible body piercings and tattoos than an ineffective handshake, according to a 2001 survey of human resources professionals.” Though this article is dated, I think a good handshake is still a vital component of the first impression. Okay, some pundits go a bit far with their explanation of a proper handshake. I definitely feel that a person should maintain eye contact while shaking an employer’s or business person’s hand, but keeping the elbow at a 135 degree angle is a bit extreme.